Apple Music launched recently with a ton of fanfare and hype. Thus far the reviews are fairly positive, and the 3-month free trial is a great selling point, but at some point you may decide you don’t want to pay for it and need to cancel. If you’re still wondering what Apple Music is all about or don’t know whether you want to make the jump, be sure to check out our writeup of it. Signing up for Apple Music is a cinch. 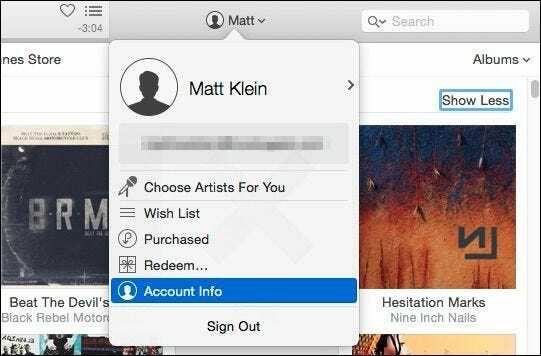 In the newest version of iTunes, released on June 30, it’s easy to add a subscription in just a few minutes. Once you’re signed up, your subscription will auto-renew every month unless you elect to cancel it before the next billing cycle begins. If you’re using iTunes on a desktop computer, then to cancel your Apple Music or any other self-renewing subscription, first click your account at the top of the iTunes window, then click “Account Info”. 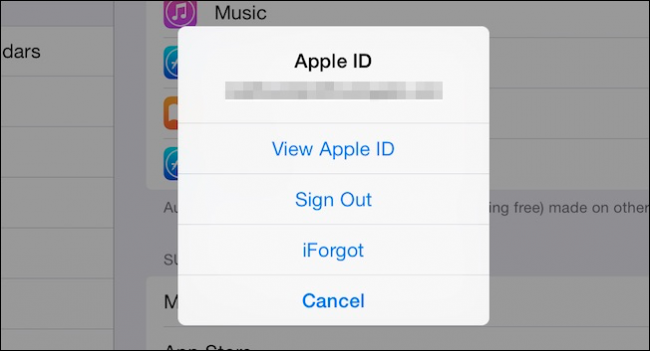 You will need to enter your Apple ID password to access your Account Info. Once you’re on your account information page, scroll down to Settings, and click “Manage” next to Subscriptions. Now you see all your various subscriptions to which you are or have been subscribed. Click “Edit” next to your Apple Music membership. If there are any renewal options, you can review those and make changes. For example here we can switch to a Family plan for $14.99 per month. 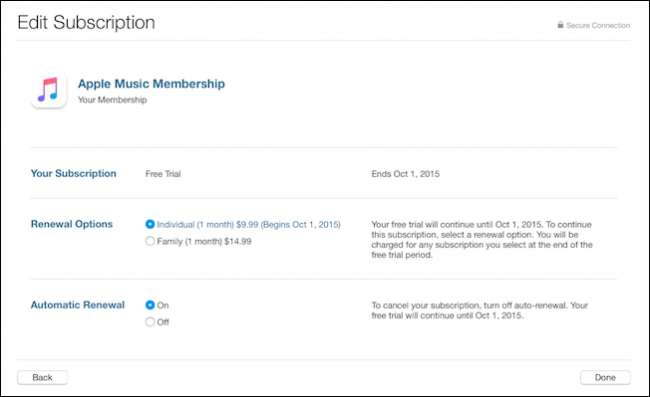 To cancel your Apple Music subscription however, click “Off” next to Automatic Renewal. When you’re ready, click “Done” and when your free Apple Music trial runs out your subscription will be canceled and you will not be billed. 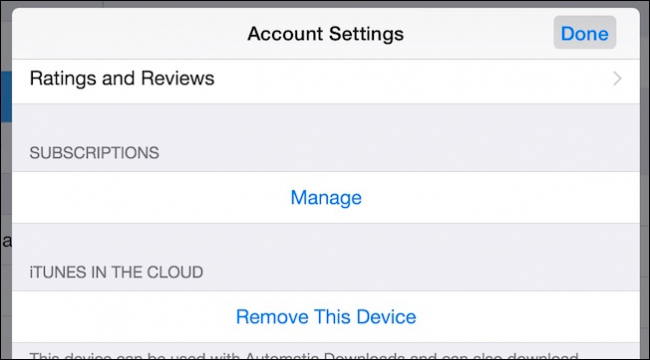 On any iOS device such as an iPad or iPhone, open the Settings and tap “iTunes & App Store”, then tap your Apple ID. Next tap “View Apple ID” on the resulting pop up dialog and then enter your password to access your account information. Under the Subscriptions heading click “Manage”. Now you’ll see all your subscriptions listed and their current status, next tap the subscription you want to cancel. 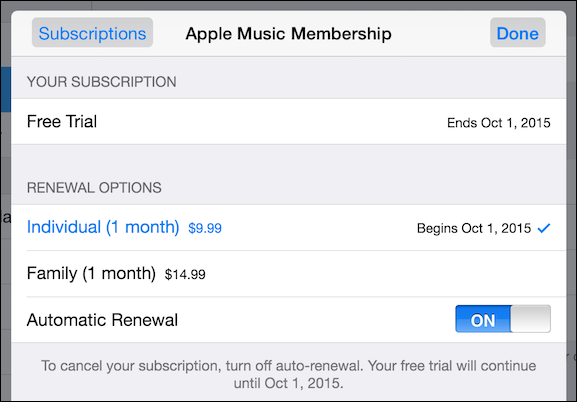 Again, just as on iTunes, you’ll see your subscription details and be able to change your renewal options. Next to “Automatic Renewal” you will want to tap the button to “Off” to cancel your subscription. When you’re finished, tap “Done” to exit and you will not be billed for Apple Music (or whatever subscription you’re canceling) after the free trial ends. Whether or not you’re an Apple Music believer is going to largely depend upon your allegiance to existing streaming services as well whether you even own an Apple device. If you use Android, you’re going to have to wait a while for the app to arrive for your device, which basically means that if you sign up for the free trial right now, you’re really just wasting it if you like to take your streaming music on the go with you. On the other hand, if you’ve already decided to check it out, then enjoy your free three months and know that you can cancel anytime using the methods described above. If you have any comments or questions you would like to share with us, please leave your feedback in our discussion forum.